Re: Why are picture positives the oposite color of picture negatives? Sarah, you asked why the colours produced when films are developed are the opposite ones from the colours in the final print and how they are formed. My job is in photographic research so this is right up my street ! I'll start with Black & White ( B&W ) photography and in particular with materials based on silver halide salts. As you probably know, B&W materials are coatings of "emulsions" of silver halide micro-crystals held in a water-swellable gelatin film. Light is absorbed by the crystals and causes a small chemical change resulting in the formation of clusters of silver atoms on the crystal surface. We then "develop" the material using a chemical reducing agent, that is a chemical with electrons available to react with other chemical species whose chemical energy state is lowered by acquiring an electron. We call these oxidising agents and silver ions behave as mild oxidising agents reacting with the reducing developing agents to form silver metal and oxidised developer. One of the amazing things about silver halides is that this development process is very slow unless the silver halide crystal has been exposed and has some silver on its surface. Only a few atoms of silver formed by exposure are enough to greatly accelerate the reduction process and if we control the amount of reduction unexposed grains will not develop but exposed grains will. You can read more about the special properties of silver halide on the Mad Scientist web-site (975608492.Ch). In B&W photographs, the silver metal is in a form which makes it black and it is the substance which forms the visible image. In other words it absorbs light and therefore controls the amount of light either transmitted through film or reflected from paper. The oxidised developer has no function. What I have described is what we call a "negative" working system Where there was bright light in the original scene, the image is dark and vice versa. By using two negative materials together, one to capture the image and one to print it, the two negatives make for a positive reproduction of the original. Now let's look at colour photography. To reproduce colour images we need to produce an image which makes our eyes and brains respond in a similar way that they would to the original scene. Because of the way our eyes capture and respond to light it is possible to reproduce colours if we are able to control the amounts of red, green and blue light in an image. We call this set of colours the "additive" primary colours because we can make any colour by adding together combinations of red,green and blue light. If we see all three types of light in approximately the same amounts, we see white and at lower light levels, shades of grey darkening to black. In photography we use three separate layers ( or sets of layers ) to capture the red, green and blue contents of the scene. Each layer is sensitive only to one of the primary colours. If you can get hold of some coloured filters you can see what the separate layers of the film "see" by looking at a scene through red, green and blue filters. Having captured the three separate images in our film we now have to develop it in a way which preserves the colour information, If we were to process the film in a B&W developer, we would get three negative, B&W images and would have no way to tell one layer form another. Instead, we make use of the developing agent which is oxidised in the process of forming the silver image. In most colour films and papers, we put chemicals called couplers into the layers alongside the silver halide crystals. We make these insoluble in water so that they don't move during processing and we incorporate them in tiny oily droplets suspended in the gelatin. These couplers react with oxidised developer to form dyes. By using different couplers in each layer we can use the differences in the colour of the resulting dyes to tell which layer they are in. All we need to do now is to get rid of the silver and silver halide salts which we do by oxidising the silver back to a silver halide and dissolving the silver halide using a silver complexing agent. When we produced the dye image we produced dye where we developed silver. That is, we produced light absorbing material where light was detected during exposure. In practice, we use image dyes which absorb the same coloured light as the light which exposed the silver halide. The blue-sensitive layer produces a blue- absorbing dye. This appears to be yellow which is the colour we experience when our green and red- sensitive sensors in our eyes are both stimulated. The green image is recorded using a green-absorbing magenta dye. Magenta is the colour we see when blue and red light reaches our eyes. To control the red light we use "cyan" dyes which transmit blue and green light. The three dyes we produce therefore control the three additive primary colours, red green and blue by subtracting one of the additive primary colours from the light used to view the image and are called "subtractive" primary colours. We can use combinations of these dyes to produce most colours. For example, if we combine the cyan and magenta dyes we subtract ( from white light which contains all three R,G&B "additive" primary colours ) both red and green light leaving blue. If, therefore, the original scene contains a bright yellow object, remembering that yellow colours result from the response of the green and red sensors in our eyes, a film will respond to the red and green light to produce cyan and magenta dyes which combine to produce blue, that is the opposite or "complimentary" colour to yellow. The same process of producing the complimentary colour occurs with any combination of the dye sets. We now have our colour negative image with its complimentary image looking nothing like the original ! so we need to go one step further to get something useful. The partner material to colour film is colour paper. This works in a similar way to the film in that it produces three negative and complimentary images using colour- forming couplers and oxidised developer. Light is passed through the negative and produces a negative complimentary version of the negative. Taking our yellow area in the original scene which produced cyan and magenta in the negative, the negative allows only blue light through to the paper. Only yellow dye is therefore formed � just what we wanted ! 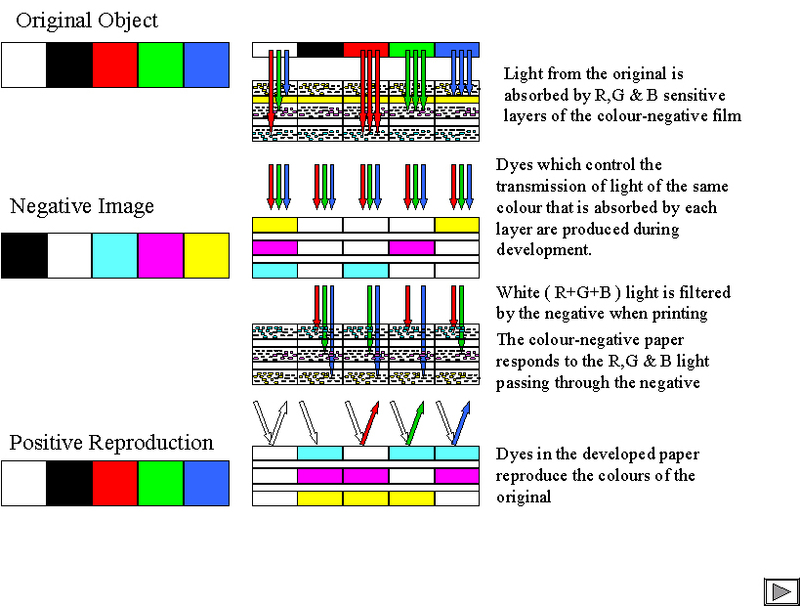 Again you can use the same process to explain the reproduction of all other colours. The diagram attempts to show some of this process. If you have a set of red green and blue filters, you can use them to see how the original at the top of the diagram and the layers in the cross-section at the bottom look similar through the filters. Hope you project goes well. Best of luck.